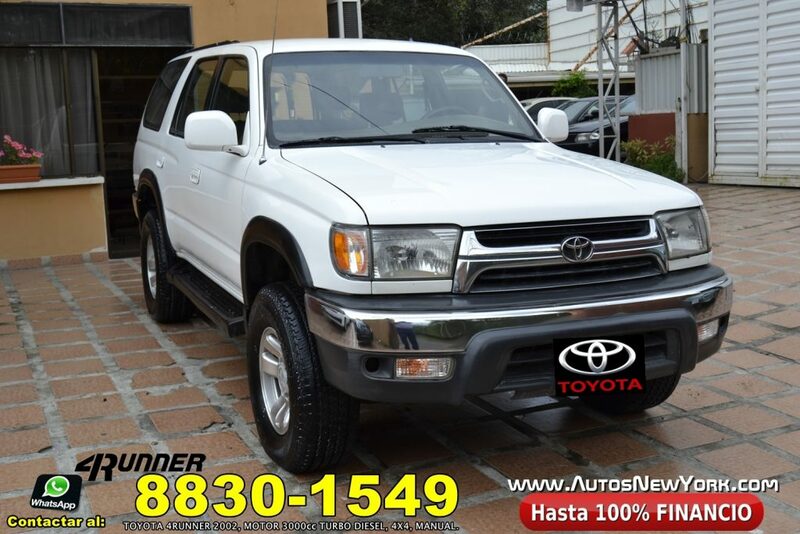 Home / autosnewyork / FINANCIAMOS HASTA EL 100%, FUERTISIMO TOYOTA 4RUNNER 2002, MANUAL TURBO DIESEL 3000cc, 4X4. FINANCIAMOS HASTA EL 100%, FUERTISIMO TOYOTA 4RUNNER 2002, MANUAL TURBO DIESEL 3000cc, 4X4. MANUAL, 4X4, 5 PUERTAS, CON FULL AIRE ACONDICIONADO RECIÉN CARGADO, COLOR BLANCO. Ya con RTV Y ESTA PARA TRASPASAR. TURBO DIESEL 5 PUERTAS, YA CON RTV Y PARA TRASPASAR, ESTA COMO NUEVO,IMPECABLE…. Full Extras. Next: FINANCIAMOS HASTA EL 100% PRECIOSO YARIS 2010 AZUL, AUTOMATICO, MOTOR 1500cc VVT-i. CON VIDRIOS ELECTRICOS. FULL EXTRAS.